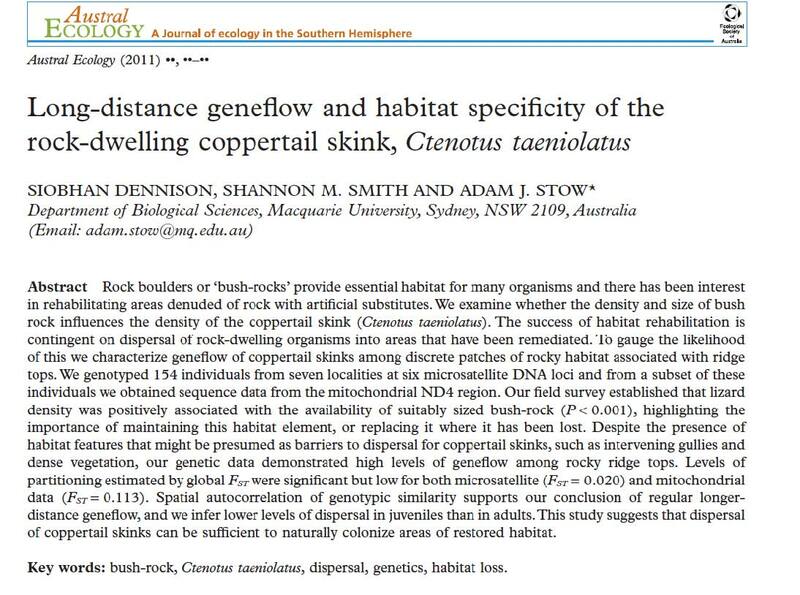 Siobhan Dennison, in collaboration with Shannon Smith and Adam Stow have just published a paper examining patterns of gene flow between populations of coppertail skinks on rocky ridgetops in NSW. This study is important because bush rock removal is a serious threat to many rock-dwelling species locally in NSW. Their findings suggest that local skink abundance is tied to rock availability and that skinks are able to disperse between disjunct rock patches and maintain gene flow. The paper is currently available as an advanced online publication and will appear in the journal in the near future. You can e-mail Siobhan (siobhan.dennison(at)mq.edu.au) for a PDF of this paper.